"...because we moved so much when I was kid (pretty much every year), stuff became my home and my comfort. My room wasn’t a structure or a place, my room was my posters and my toys. If a room had my bed, and my desk, and my Thundercats, then it was my room. And so I began a lifetime of packrat living, unable to get rid of anything, because everything I owned was a living piece of me." Yup. That was me too, and true to form I've been carting around a broken VF-1 Varitech toy for almost 15 years because even though it had a busted arm I couldn't bear to part with it. Then today I was invited to like a Facebook page called Jamiko's Action Figure and Collectable Repair. 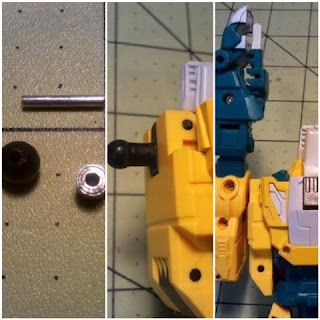 The service is run by Jamiko Hercules, a dad and a jack of all trades who recently went into business repairing Transformers, Robotech/Japanese Robot toys, and basically any complex, non-electronic toy or collectable . I got in touch with Jamiko to ask him about his business and the mission of saving broken toys. Quote: "If it can be fixed, I can fix it"
An Interdisciplinary Life: This looks like a cool service. How did you get started, and why are you the person filling this need. Basically who the hell are you and why should we entrust our toys to you? IL: Yeah, my friend just posted a story about her 5 year old daughter secretly creating a new Netflix profile so she could get around the parental controls. I'm like, "My kid just learned how to use the space bar to pause and un-pause." It's been a struggle for me to figure out how much technology and at what ages. JH: That's the game you play as a parent in the 21st century. You want your kids to go out and ruckus, and skin their knees, and at the same time you also don’t want them to be behind the curve. The thing about computers is that the thing that stops people from doing anything with them is fear. They don’t want it to break, but unless you throw them against a wall, you kind of can’t really break them. Just messing around in a program you can’t break it. You can get somewhere and you don’t know how to get back, and then you need to ask for help, but you can’t really break it. Someone told me, years ago, "If you don't learn computers now, you'll never learn." But because things change so rapidly you can really jump in at any point. Learning computers is like the universe. There’s no beginning and no end. No matter when you start you're at the center. Anyway, my son can do all this. I’m figuring it out. IL: That's deep man, but we're way off topic. Who the hell are you? Why should I send my broken Transformers to you? JH: I started off building model cars and I quickly found that the pieces I wanted, because I didn’t want to build out of the box, I wanted to build what was in my head, weren't available from manufacturers or from third parties. I had to start scratch building them myself. So I started getting parts and doing that. After about 20 years of that I got good at it.